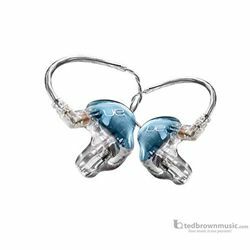 The UE 5 PRO is a dual driver custom in-ear monitor with exceptional frequency response and extended headroom. It is available in any color and can be personalized with individual artwork. Dual Drivers offer powerful audio for stage performances. Experience smoother frequency responses for higher-quality sound. Includes an IN-LINE IOS phone cable to let you answer calls with just one touch or change tracks and adjust volume. Each order includes a personalized carrying case & cleaning tool! Internal speaker configuration: 2 balanced armatures with 2-way crossover.